As a drywall sander, the Festool Planex Easy is an excellent tool for the job. In the end, it's what you expect from Festool - highly effective performance, outstanding dust collection, and ergonomics that will be tough to beat. One of the uglier bits of construction and remodeling work revolves around drywall installation. Sanding down drywall mud not only creates a big mess, but it also launches all sorts of dust into the air – even silica dust in some cases. For those of you who have the distinct pleasure of sanding down drywall, rejoice! Festool has a solution for you with their Planex Easy drywall sander. This new sander will not only eliminate almost all of your drywall mess, but it should also keep dust from shredding up your lungs. First of all, Festool prioritizes simplicity with the Planex Easy drywall sander design. This sander pops out of the box ready to work. Simply plug it in and go. While this sander can attach to most dust extractors, Festool designs their products to work optimally with their own line of products. We used Festool’s CT 36 E AC Cleantec dust extractor, which works seamlessly with the Planex Easy drywall sander, but any dust extractor that has a 1-7/16″ connection diameter will work. Festool even includes an integrated swivel lock that keeps the Planex Easy connected to the Festool CT hose. If you’re already using a Festool CT, note that the Planex uses Festool’s larger diameter hose than what you use with their sanders and other woodworking products. Again, think “simplicity.” The Planex Easy comes with a single on/off switch and variable speed dial. You don’t expect some convoluted control system on a sander anyway, and this one won’t be the one to surprise you. The majority of our work had us lifting the Planex Easy drywall sander over our heads. And, as you might imagine, when you spend a lot of time sanding ceilings, be it removing popcorn or prepping new drywall mud surfaces for painting, you’ll appreciate a lighter tool. This one weighs in at a well-balanced 8.8 lbs, which is lighter than it looks at first glance. From a fatigue perspective, we didn’t have any trouble smoothing out our ceiling patchwork, and the long handle provided good access to our high ceilings. Festool also chooses to use a larger handle and shaft for this model. Larger diameter handles can make a handheld tool more cumbersome, but it’s helpful here. For one thing, the larger handle and shaft provides a solid, comfortable grip. Where a thinner shaft might initially seem preferable, it has the potential to be too flimsy. No matter what job site you’re working on, it’s nice to have the sturdy, unbending shaft that Festool designed with this model. The Festool Planex Easy drywall sander performs really well on all parts of the wall and ceiling. 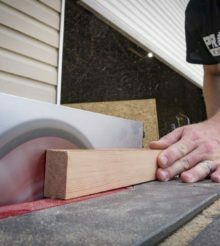 For one thing, its direct drive, brushless motor provides plenty of power for super quick sanding, and the whole operation feels really smooth for a tool that has the potential to be really awkward. Festool designed this sander with an articulating knuckle joint behind the 8-1/2″ head, which keeps the sanding pad flat against the surface as you work across the material. Not only is this sander very maneuverable, they’ve also designed the front brush segment so you can easily remove it. Basically, when you come up against an inside corner, you can pop off this front brush segment, allowing for flush sanding in that hard-to-reach spot. Finally, the million dollar question – how well does the dust extraction work? As you know, sanding down drywall is generally a messy affair, but the Festool Planex Easy drywall sander makes it far less so. Festool designed the Planex Easy so that dust can flow through and around the sanding head. It’s an effective design that eliminates almost all of the mess. Unfortunately, the system isn’t quite 100% perfect, and we did notice trace amounts of dust was able to escape. Still, the very thin layer of drywall dust we left is much more preferable than having to try to clean up after a sander that doesn’t incorporate any dust extraction. Less mess and less breathable dust is a big win. The original Planex runs $1260 and the Festool Planex Easy is much less at $750. You’ll have to give up some features to save the money. You won’t have adjustable lengths, two speed gears to choose from, or the ability to pack it up in a Systainer. You still get excellent performance and design, though. There are cheaper options available if you’re willing to make compromises in one or more areas of the design. Ultimately, this is still a premium tool and you’ll have to give up significant characteristics if you want to drop to a lower price point. As a drywall sander, the Festool Planex Easy is an excellent tool for the job. It doesn’t break down into as small a storage space as the original Planex and you miss out on a couple of features, but you save $460 to go the simpler route. In the end, it’s what you expect from Festool – highly effective performance, outstanding dust collection, and ergonomics that will be tough to beat. Find a Festool dealer here.